Some books are so damn good it seems a sin to write about them. Just go read it, that’s all! Such is Sebastian Barry’s A Long Long Way, (2005, ) a novel about Irish soldiers in WWI. I’ve read half a hundred novels about that war, some of them very good, memorable, heart changing but none as good as this. Barry has a gift of language that takes the standard template for war fiction and turns it into something fresh and new, something by which our knowledge of history is enlarged and our emotional intelligence greatly raised. For Irish young men in August of 1914 when Great Britain declared war on Germany, the future was to reveal many surprising ways to be a hero, or a traitor. Ireland had been part of the United Kingdom since 1800, and as generations of rebels asserted, had been occupied by British-Normans since the 11th century and tied into the kingdom from at least the time of Henry VIII. By 1914, for many Irish, it was just the way things were. The great famine was two generations in the past. The rain fell, the sun shone, crops came in, shop keepers kept shop, Guinness was a primary food group and let the world go on as it may. Many young men responded to General Kitchener’s August call for men to join the New Army as their compatriots in England, Scotland and Wales did: Where do we sign up!? Conscription was not in force and not needed in those late months of 1914. War was said to be a great adventure. It would be over by Christmas and no one wanted to miss a day of it. 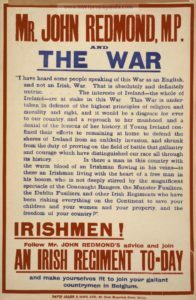 And besides, even for those not caught up in revolutionary slogans about Ireland and freedom, the promise of Home Rule, by Ireland’s own John Redmond, MP, was in the air. By fighting for England they would be fighting for Ireland as well. Willie Dunne, in Barry’s telling, is seventeen years old, the son of the Chief of the Dublin Metropolitan Police, and too “damnable” short to make his father proud. Despite his first-sweetheart Gretta’s worries, he is as willing as the next lad to fight and so lies about his age to get in; Gretta, whose father had been “thumped on the head” by Willie’s policeman father at a demonstration. Soon Willie is being trained to be one of the Royal Dublin Fusiliers, writing his father thanks for some under-drawers, and hoping for a letter from Gretta. Christmas of 1914 comes and they are sent off, by train, and boat and onto big lorries in France. We meet his comrades and his Sgt Major and hear the jokes they tell and the life they live – latrines, rain, going out in the dark wet and mud on wire-mending expeditions, shivering face-down in the slime as unknown silhouettes go passing by, puking through their first shellings. He writes his first letters to his love, Gretta, read by the Capt, as all out-going letters must be. On a day in early April, 1915, in the reserve line, they go swimming. and comes the most effective description of a gas attack (the first to use it were the Germans, on April 22, 1915 ) I’ve ever seen. Barry speeds through 1915, including the rain and cold of winter and gets us back to Ireland in early April, 1916, for a furlough with Willie. He is lovingly welcomed by his three sisters, especially the 8 year old Dollie, and bathed and de-loused by his own father, who hints at the rising troubles in Dublin. As the furlough ends and the boys are boarding the ship to go back to Belgium suddenly a swirl of orders comes and the soldiers are marched back into Dublin. They see a mounted cavalry charge down Sackville Street. Rifle fire is heard around the post office. The young soldiers are told to build a barricade, then to advance. Three of his comrades lie dying at his feet. It is the Easter Rising, 1916. To the Irish lads in the British Army, it is nothing short of bewildering. Pamphlets are handed out which claim that the Germans are the allies of those behind the barricades. For the rest of the novel rumors and events from the Rising and the British execution of the leaders, and that which followed it give shape to the novel and to the person that Willie is to become. The confusion of both wars, the sorrow brought, the endurance beyond understanding bring us to an understanding of war, like few other books I have read. Marvelously, although the novel is 293 pages, most of it at war, we do not sense the repetitiveness almost inevitable in other books on war — and surely repetitive for the soldiers themselves. By the magic of his prose Barry brings us into another day in the trenches, another attack, another friend dead –the same, and yet different. The emotions of the men, fearful of course, but interrupted by dark humor and strengthening friendships, are the height of a story teller’s art — and none of it suspended in a scaffolding of God and Glory. Yet we are kept attentive — not being pulled by the power of war, the threat of death, as so many war stories do, but pulled by the power of the story-telling. We see war as it is; men’s behavior to each other, not just from the enemy but, in the most savage cut of all, in the fearful sad, sickening thing one friend does to another, a sweetheart does to an absent man, or a father does to his son. It is told in mostly a straightforward, calendar narrative. An omniscient narrator describes the actions of the men, and what is going on around them. We learn things we might not know about the war. Often the observations could as well be from one of the men. “The promised Chinese laborers didn’t appear and a detail from among the last 400 man was drawn and all corpses, German and Irish, were carried back a ways and yet another little graveyard was instituted. There were no white picket fences, headstones, or the like. Just row after row of irregular beds, like a poor man’s vegetable plot, and into these loamy beds were lain the vanished soldiers. What I pay particular attention to as I read these war-related novels and memoirs, is what the writer’s understanding of, and attitude towards, war is. What do we get from the narrator; what do we get from the characters? To my mind, Barry has hit the almost perfect chord of sensibility. Young men want to go to war, often for reasons they can’t fully explain, but it has something to do with their sense of manhood and protection of those weaker, something to do with breaking out of what they know into the adventure of travel and the unknown. Their experience of the fighting is beyond anything they might have imagined but by and large they adapt — to extreme discomfort, extreme fear, rough friendships. Barry manages to describe the experiences in absolutely real detail, yet without an overwrought sentimentality. A man pisses himself in fear, more than once, but it is recounted as another among many things being experienced, neither shouted nor underlined to call our attention to it. “There was barbed wire everywhere put in by scores of successive wire parties, going out on nights like these, under stars like these, with hearts like these, German and Allied, pounding and leaping into throats. Or several times when mention is made that both British and German soldiers are lying together in a common bomb-excavated graveyard. Even the world-wide soldierly griping about their superiors is matter-of-fact, tongue in cheek instead of over-the-top and intent on showing all flag officers to be fools. Set to drilling when in the reserve trenches, the men curse and grumble. A priest hears confession and we get that it is important to the men, even if not particularly devout. Father Buckley comforts as best he can, even when he, himself, likely no longer believes in God’s mercy. I can do nothing better to convince you to read A Long Long Way than to leave you with a few wonderful stretches of language, like few I’ve come across in my reading life. “It was the very seam of night and morning….and a fine muslin-looking light pierced in wherever the window shutters were not snug. I was particularly struck by unexpected juxtapositions that nevertheless created something immediately clear, and as if known. The evil gas lay down in the trench like a bedspread … and passed on then, ambitious for choice murders. There were bombs falling everywhere now in an industrial generosity. Not just “the smile of death” but the corpses, whose “lipless teeth all seemed to have just cracked some mighty jokes. The major laughed his odd, flinty laugh, like a sheep coughing in the mist. “But everything, no matter what, no matter how vexing, ruinous or cheering, could be brought into battle, with the rest of a soldier’s pack. It had to be; grief and horror could not be left behind. They folded to nothing and were carried like boulders.